A Tot lot is part of a playground for very young children. Tot lots are designed for toddlers under the age of 2 and focus on a wide range of developmental benefits to children. These are the best ones in the US. Kids Kampus at Metropolitan Park in Jacksonville, FL - Not your ordinary playground, Kids Kampus electrifies the imagination. Young visitors may experience solar power or become a drop of water and discover the St. Johns River. Kids Kampus is a 10-acre city park and educational playground in Jacksonville, Florida built with the purpose of stimulating children mentally, socially and physically. Kids can dance down the yellow brick road or drive down the mini-downtown Jacksonville landmarks and indulge their natural curiosity. Kids Kampus Park provides fun in a safe learning environment and relaxing activities for younger children and families. El Portal Tot Lot in Miami, FL - Tucked behind the City Hall in the charming Village of El Portal is the El Portal Tot Lot which features some nice new playground equipment including two swing sets. Tot Lot Park in St Peters, MS - Tot Lot Park is a small neighborhood park located at 259 Bellemeade Drive near Kimberly Road that serves the neighborhoods of Brookmount and Bellemeade. The playground was renovated in 2009 to include state-of-the-art play equipment, a rubberized surface area, and a fence completely surrounding the playground. Bates Road Park Tot Lot in Rocky River, OH - The Bates Road Park Tot Lot features several slides, climbing areas, and tunnels in a playground designed especially for kids ages two to five years old. EXPLORE Village at Legoland California - EXPLORE Village provides a whimsical setting where our younger guests will find wonder and adventure. Venture into the wilds of Africa on Safari Trek and see life-sized giraffes, zebras, lions, and more - all made of LEGO® bricks. Ride the LEGOLAND® Express or glide along in a leaf-shaped boat on Fairy Tale Brook, sailing gently through different fairy tale scenes featuring characters built of LEGO bricks. Enjoy Water Works which features an interactive water play area, complete with a musical fountain - hop up and down to make the instruments play. Jake's Play Lot in San Jose, CA - Jake's Play Lot is part of Parma Park. It is near the intersection of Camden Avenue and Little Falls. It is now fenced off from the nearby roads for extra toddler protection. 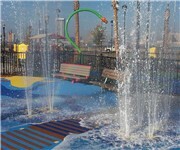 It offers a water play area and a climbing wall, suitable for small children. There are small train vehicles, swings and jungle gyms. Hours of operation are generally daylight. Redmond Town Center Sound Park in Redmond, WA - Fun Play area for the smaller kids (ages 2 to 9 posted) with a lot of metal noise making devices. The hours flucuate during the seasons, the park has the same hours as the Mall. There is also some water 'toys' that make sound and can spray but water is shut off during the winter months. A little room to roam within the fenced area. Lots of benches outside for the parents and next to Tully's for the java fix if needed.